This coin was minted for use in Australia. Although by the time of this coins minting Australia had severed most of its ties with the British since the Statute of Westminster 1931, they would not formally sever all ties until 1986. The Queen was born in London on 21 April 1926, the first child of The Duke and Duchess of York, subsequently King George VI and Queen Elizabeth. Five weeks later she was christened Elizabeth Alexandra Mary in the chapel at Buckingham Palace. She is married to Prince Philip, Duke of Edinburgh, who is the son of Prince Andrew of Greece and a great-great-grandson of Queen Victoria. Her son Prince Charles is heir to the British throne. She has been the reigning monarch of Britain for over 60 years. 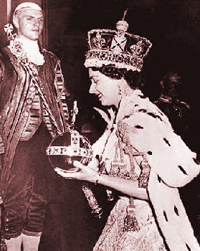 She was born April 21, 1926 and ascended the throne on February 6, 1952. Her portrait is on all British currency as is the custom.